We'd love to hear any feedback, good or bad. Please let us know if there are any ways we can improve our service. What does the EnergyElephant iOS app do? Why does the EnergyElephant iOS app need access to my camera & photos? Why does the EnergyElephant iOS app need my location data? How do I reinstall the EnergyElephant iOS app? What do I do if the EnergyElephant iOS app crashes? The EnergyElephant meter reading app is designed to allow you to quickly and easily submit your electricity or gas meter reading by just taking a photo of the meter reading. If you have an EnergyElephant account, we can then pass this onto your meter reading operator to make sure your bills remain accurate. In some cases your supplier will give you a discount for providing accurate metering data. No more estimated energy bills. Over 75% FASTER than typical meter reading systems and other apps. Easy to use - take a readable photo and submit! No need to remember difficult account numbers or meter point reference numbers etc. All you need is your email address. No more reading errors. We sanity check your meter reading to ensure it is in the right ball park to the reading we expect, so no more "fat fingers" typing in an extra digit by mistake. Annual Energy Use: Calculate your annual energy usage, costs and CO2 emissions by taking one meter reading at the beginning of each year. Seasonal Energy Use: Calculate your seasonal energy usage, costs and CO2 emissions by taking one meter reading at the beginning of each season. Monthly Energy Use: Calculate your monthly energy usage, costs and CO2 emissions by taking one meter reading at the beginning of each month. Weekly Energy Use: Calculate your weekly energy usage, costs and CO2 emissions by taking one meter reading at the beginning of each week. Daily Energy Use: Calculate your daily energy usage, costs and CO2 emissions by taking one meter reading at the beginning of any two consecutive days. Estimate Night Use: Calculate how much energy you use at night before investing in installing a night rate meter. Take a meter reading on a typical energy use night, at the beginning of the night rate tariff time and again in the morning when the night rate tariff time ends. Most night rates commence around about midnight and end in the morning around 7 to 9 hours later. Estimate Peak Daily Use: Take a meter reading at the beginning and end of the day most energy is used in your building. Estimate Weekend Use: Take a meter reading at the beginning (Friday evening) and end of the weekend (Monday morning). Estimate Minimum / Baseline Daily Use: Take a meter reading at the beginning and end of the day most energy is used in your building. Estimate Energy Leakage: Calculate how much energy is leaking by turing off all power consumers (where safe to do so), taking a meter reading using the app, and a few hours later (i.e. over night), take another meter reading to see how much has been consumed. Estimate Energy Usage of new equipment: Take two meter readings to establish a baseline, after taking the second meter reading, turn on the new equipment. After an hour or so turn off the new equipment and immediately take a meter reading. The new equipment energy use will be the increase in energy use between the two periods. Estimate Energy savings of upgrades: Take two meter readings to establish a baseline, taking the second meter reading before the energy upgrade has occurred. After a sufficient period of time take another meter reading. The energy upgrade saving will be the decrease in energy use between the two periods. 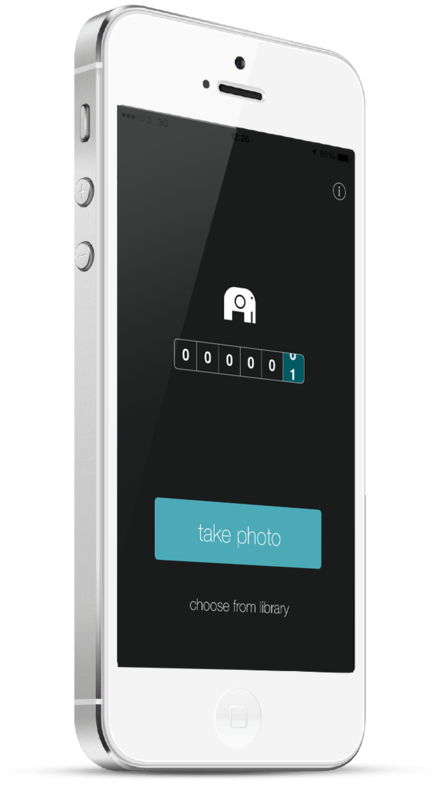 The EnergyElephant app uses your device's camera to take an image / photo of your current meter reading. By allowing access, our app can record the meter reading by simply allowing you to take a photo of the current meter reading. The reading is then extracted from the image and emailed directly to the user. The app also allows you to take a photo offline and to later access the image via the app for submission. This can be helpful when you have several meter reading to record and/or where the data coverage for your phone is poor or slow. Don't worry, we don't access any images unless you submit them via the app so your data is safe and secure. The EnergyElephant app uses your device's location data to determine where your meter reading photo was taken either via the app or by accessing photos on your smart phone. This allows us to see where your energy data is being collected from. We use this to make sure we are matching the meter reading to the correct account, using the correct degree days information for your location, that any conversion factors used are appropriate to where you are using your energy (such as natural gas conversion factors from volume (m^3) to energy (kWh)), and other interesting energy related features. For these reasons, EnergyElephant (like lots of other apps) needs special permission to access your camera and photos. Apple's privacy settings for photos are separate from location services, so the app will simply ask for permission to access your photos. In either case, the app will not be able to upload photos to your EnergyElephant account unless you OK it first. You are more than welcome to upload images without location data, but we will not be able to use the advanced location services mentioned above without this data on your account. Understanding iOS Location Services For information such as how to tell when an app is using location services, steps to reset or change your location settings, and to learn more about iOS location services, please see Apple's Understanding Location Services support article. Apple's API reference For iOS developers or highly technical readers, check out Apple's Developer documentation to learn more about the API library EnergyElephant uses to access iPhone and iPad photo galleries. If you're experiencing ongoing technical problems with your EnergyElephant iPhone app, you may need to reset the app from scratch by deleting and reinstalling the app. Doing this should reset your settings and resolve most usual technical errors. Don't worry, uninstalling will only remove the app and its settings from your iPhone. Your EnergyElephant account won't be effected and the data in your account will be safe and sound on our servers. From your home screen, tap and hold the EnergyElephant icon. You'll be asked to confirm your decision to delete the app. Confirm to delete the app from your phone. To reinstall, simply search the App Store for EnergyElephant or visit the EnergyElephant website from your web browser. Swipe through to find the EnergyElephant app. Swipe the EnergyElephant app's preview upward to close it. From your home screen, tap and hold the EnergyElephant icon until it starts to shake (like a mini earthquake is occurring on your phone). Tap the small "X" that appears at the top-left of the app's icon button. You'll be asked to confirm your decision to delete the app. Confirm to delete the app from your phone (or hit cancel). Open the App Store and download the EnergyElephant app again. If you are still having problems please contact us and let us know what's happening.